A couple of weeks ago we talked about there are tons of options for knockoff bands imitating the Hermès high quality leather bands. The quality really varies from one and another but so far I have not seen any bad comments towards any of the dozens of vendors. One of the most popular Apple product accessory manufacturers from China, Hoco, has recently released a 3-in-1 bands bundle with all the three styles of Hermès Apple Watch bands for just CNY 298 (US$46), that you may need to get all the genuine ones along with the Stainless Steel watches for US$3,850. It comes with 38mm and 42mm, with all 4 color options you can get from Hermès. Hoco has had just released the 42mm model two weeks ago followed by the 38mm ones a few days ago. The package appears to be exclusive for China market at the moment as I could not find any of these on eBay yet. We are lucky to have got the package today and get hands on these bands for 38mm Apple Watch size shipped from Hoco flagship online store for a review here as some may have requested for that some days ago. One of the major reasons to get the watch band set is that, there is no standalone bands from Hermès for Apple Watch, especially the Cuff band is exclusive for 42mm size Apple Watch at the moment. But it really looks cool to put on, for both casual wear and business attire. But it is not at the level that I would pay thousand bucks and get another Apple Watch. In addition, there have been several calls on third-party “Hermès” bands on Reddit so I think famous brand like Hoco could have done a good job on that. Another reason is very straightforward: I really love the design of it especially after the famous blogger Jeff Benjamin showed off his try-on of this particular band. You will expect to have some sort of “kit-set” of the bands that you can configure and combine per your wish. It comes with the assembled Cuff band and the longer band for Double Tour band. To learn how to remove the band with the buckle, you can click here to watch from the official tutorial done by Hoco (in Flash media format). The quality is excellent at this price tag. It is genuine first-layer calf leather and well-manufactured. It smells good without any kind of chemical-kind of smell. Despite the fact that it is definitely not as premium as what you could expect from Hermès as those are really well-picked from the production line, I have to say, it is far better than the Hoco Leather Band with Classic Buckle ones that we reviewed and you may also find it with very low-cost options on eBay or so. The leather is quite durable as far as I have tested and it is quite soft hence super comfortable to wear. The design of the metal buckle does not really look close to the one from Hermès. The quality does not match, it is still strong enough to hold. The adapters are well-polished, no friction when putting onto or off from the Apple Watch. Notably speaking, the leather for the Cuff band is just well adapted to allow the heart rate sensor to stay in contact with the wrist as what you expect from Hermès. Two major downside: 1) You can’t really put it to charge on a charging dock like the iNERTIA Rainbow Stand, but just barely chargeable on others like the Mophie Watch Dock, because that the band has elevated the watch and does not allow any touch point there; 2) It is quite a difficult task to take out one of the bands that comes with the buckle to combine for Single or Double Tour bands. But as I really liked the Cuff band and for that Double Tour looks more feminine, I did not plan to take it out again except for the coverage of this review. I made an appointment at the local Apple Store and tried on the Hermès Apple Watches. In the meantime, more importantly, I have also taken a few pictures of the bands in order to make a comprehensive side-by-side comparison for you to get a feeling of what to expect here. Without a doubt, there is nothing really near the genuine Hermès bands in terms of design and quality. With less than $50 price tag, you can’t expect yourself getting supreme leather as well as the exclusive Watch Face from Hermès. Nevertheless, the quality offered is a value for money it is really a good deal that indeed you can enjoy 3 different bands which is around $15 for each, and with a freedom to choose or switch from one to another. Nothing I can really complain about but I do not recommend switching from the Cuff band to the other combinations as it will take you some effort and time to take the band with buckle out from the Cuff. Do bear in mind if you purchase it. So what do you think about the Hoco Replica Hermès Bands? Do you like it? And do you plan to buy one and try it out? Let me know in the comments and for more Apple Watch Band reviews, check out the list here! Disclaimer: I am not hired for helping Hoco to promote with free samples. I paid the full price for the package, tried it out and present my personal feeling and experience with the bands. Edit #1: For those who are curious about the link to the bands, here it is. Edit #3: Or you can order from Focuseak. Based on your review, I have decided to pull the trigger and order a set on eBay. They look pretty good and don’t look “cheap”. They actually look pretty close to the Hermes when I compare the pictures. 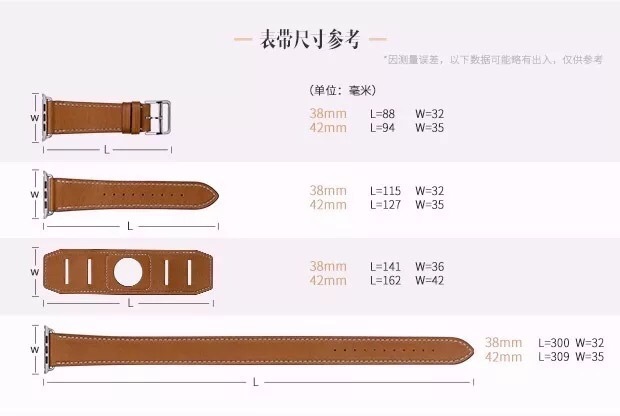 Would the 42 mm be the exact same size as the Hermes as shown in one of your comparison picture? Are you still happy with them? Do you know what the 2 lengths are in MM? Received the 42mm n I love it. Hopefully the leather will age as u wear it n won’t wear out too quickly. Happy with the rah purchase. Sweet review Superman Steven Chan! I was looking for the hermes replica as well. Eventually I ended up at http://www.alternativewatchband.com, unfortunately they didn’t had the hermes one yet. So for hermes replica i cant say much. however they did have the other HOCO products and can say something for the quality of the products by this brand. I got a leather one for my girlfriend and a metal one for myself for x-mass, the quality was way better than expected. Wearing the milanese loop band for 2 months, and my girlfriend the leather one for 2 months. Still in great shape without scratches. The leather one doesn’t seem to wear out like other reaaally cheap brands I tried. Hey Bryan, thanks for visiting and also the compliment! Glad to hear that your Hoco bands are in good shape! do you know what hoco’s warranty is on these straps? Personal I prefer real handmade watch straps. On Etsy there are sellers who are selling these style bands with much higher quality and handmade. If you search on Apple watch leather cuff you find lots of nice cuff bands. Thanks. You can find a few handmade leather cuff band review on my blog as well. Check it out! I get it today and find the strap great leather quality like the one you review. Love the style of the double tour cuff band for my watch.